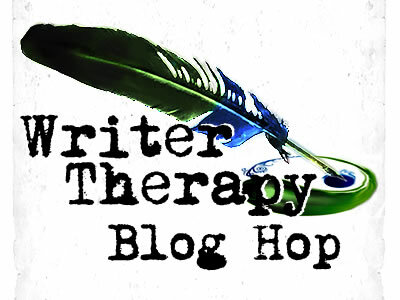 Today is the blog hop for Writer Therapy, a fun a quirky blog for writers of every stripe… And I almost completely forgot!! My brain is in the sick zone today. I have a kid with a fever, a husband with a fever, and my own clogged up thinking process to tend to today, so you’ll (please?) excuse the lateness of my post. To participate in the blog hop, follow these simple steps. Write a post about what you use as your writing therapy (pinterest, chocolate, a TV show, book, ect) and how it helps you. 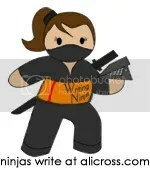 Have your blog post go up on the morning of October 22, 2012. We’ll post a new blog entry here early that morning with links. If you sign up for the blog hop, make sure you comment on at least 5 other blogs on October 22. My own therapy is reading. And TV. And chocolate. And naps. Apparently, I need a lot of therapy!! In a way, writing itself is a therapy for life. All the ups and downs are fodder for the next plot idea or character arc. But! When I’m stuck and the muse is silent and my characters are mad at me, I watch some of my favorite TV shows, read some of my favorite books, and buy out the chocolate from the gas station next door. I know every attendant there and if I’m buying chocolate in bulk, they know to stay silent and look away because Crazy Writer Lady just walked in. Great. now I’m thinking about chocolate. A lot of chocolate… Okay. Now I have to go next door and buy some. I hope they’ve restocked since I was there last! This entry was posted in blog and tagged Blog, character arc, Chocolate, Writer Resources, Writing therapy. Bookmark the permalink. ooo chocolate is so good but so dangerous! I’m jealous you have such a close supply. And I wish I could nap but that only happens when I’m sick! I envy people who can nap! Great point about the ups and downs, that’s so true. It’s great writing fodder. Chocolate… yum… so lucky you live by a gas station! My chocolate stash is almost out. I’m down to my last m&m’s, sadly. But I agree that writing itself is usually my form of therapy. I’m so much happier when I’ve had a chance to write! It helps me cope with all the other stresses. Hope your sick kid-o gets better! I’m surprised at how many of these posts mention TV. TV for me is evil evil evil! Of course, I have the tendency that once I sit down to watch TV, I don’t get up unless there is a fire. And YouTube is just as bad. So many little interesting videos! Chocolate? Where!? I needs to gets me some…. nom nom nom. Oh man! I want chocolate now! Mmmm….chocolate. Heh. But your comment that writing IS therapy hits home. Especially for someone like me who has 50+ hour workweeks as the manager of people (tall, whiny children is more like it), sitting down at the keyboard is the therapy I crave. Great post! Cheers! First and foremost–I LOVE YOUR BLOG LAYOUT! I’m so very much so in a Halloween mood these days and this is just adorable! Food in general is such an easy diversion…er THERAPY for me it’s ridiculous! My poison happens to be dill pickles. I love them. Lots of them. All of them. All. The. Time. Your therapy is the same as mine. It’s a scary thing when there’s no chocolate in the house and I need it! That’s why I count myself lucky I live next to a 24 hour gas station! !